Never judge a book by its cover, which is one rule I try to stick to, especially with music. But sometimes, I find that I can't always push the visual I am handed out of my mind. 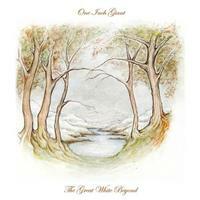 The cover for the new ONE INCH GIANT album, “The Great White Beyond” kind of reminded me of a Winnie the Pooh cover. Before I get a lot of back-lash for that statement, I happen to love Winnie the Pooh so I went into this hoping that will enjoy this album as much. When the first track of this second ONE INCH GIANT album began, I was happily surprised that it was amazing! Track four, “Jiraiya” is the only track on the album without vocals, and happens to be one my favorites. Not because Filip Astrand's vocals aren't good, because that is a complete lie, but just because it had a serene sound to it. Another favorite of mine was track eight, “Awaiting the Wave”. I am a huge fan of acoustic guitar so to find that they used one for this track, made me very happy. I did like this album, and I will say, there is a difference between hearing music and listening to music. And I truly listened to “The Great White Beyond”. There were no issues with it for me. It was as close to “perfect” as some albums get! I fully recommend this album to everyone. I can almost guarantee that you will be impressed after just one listen!